Ohhhh pretty! Does one have to part of the club to purchase some of the extra fibre? oooohhhh swooooon. Adrian, you are killing me. Seriously. So cute! I live in the city now, and I miss chipmunks!!! Awww…isn’t he just so adorable? 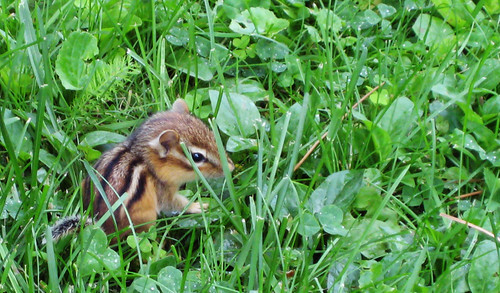 We don’t have chipmunks on the west coast, but I did where I grew up, so I miss the spunky little things! Oh! Such a cute chipmunk! I see lots of chipmunks where I live (and I’ve been seeing little kiddos lately), but they never sit still long enough for me to take photos. Honestly, they move so fast, I think they teleport. OMG!!! The chipmunk!!! So cute!!! Fear the munk. They eat cars and light trucks. 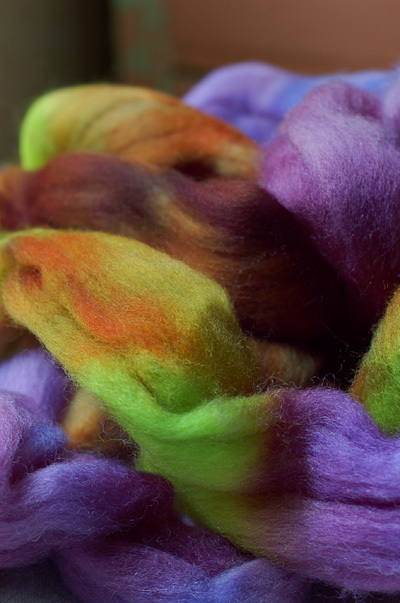 Ok, when I saw the picture of this month’s fiber, I rubbed my hands together like a greedy old man. Or Gargamel with an evil plan. Do baby chipmunks wear sweaters? Cuz he would be adorable in one. OMG – I love him. Or her. Extremely cute. Did you know the chipmunk is my power animal? Yes. I love me the chippers, and that one just is more than adorable. OMG! That little guy is so cute I can hardly stand it!!! Hmm, if he were in my yard though, his life span would be about 2 minutes long, as Sam would be on him SO fast. I regret that I’ve never been able to teach Sam to appreciate the wild life in the backyard from a distance! How is it possible for something to be so tiny and cute?! I love that little guy!